Ever since 2008, Apple has offered the Mac Pro as their top-of-the-line performance computer. It's been 4 years since the latest cylindrical Mac Pro was released, neglected because its controversial single-fan cooling system and restricted expandability went south with pros. Apple has already confirmed a major refresh of the Mac Pro coming in 2018, but little is known about the next-generation desktop, which will likely require users to buy a display separately. If you want one as good as the recent 5K iMacs, it's going to cost upwards of $1,300 just for the screen alone. Now comes Apple's brand new iMac Pro, due to release in December. With technology advancing faster than ever before, Apple is finally able to equip an all-in-one iMac with some of the best computer components available, impressing with the ability to fit it in such a small, impressive design. The most controversial piece of the equation with the iMac Pro is the price. Starting at $5,000 for the base model, it's definitely not cheap. 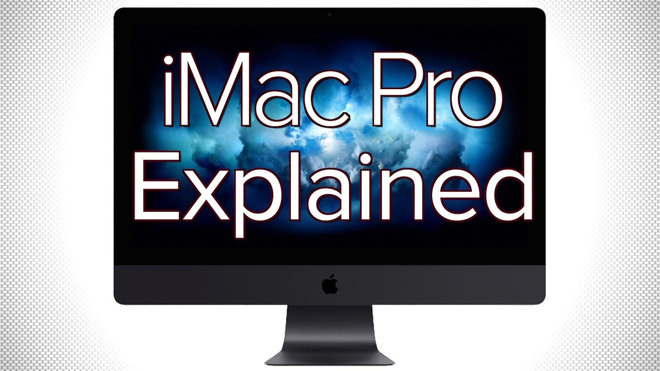 But you need to remember that the iMac Pro is meant for the kind of user that actually needs that level of performance for 3D animations and rendering, VR content creation and video editing. PCGamer.com decided to see if they could build a Windows PC comparable to the iMac Pro, and it came out to just under $4,700 just for the parts alone. Consumers looking to build an alternative PC would still have to build the whole computer by themselves and risk messing something up, or pay somebody to do it for them. We've built many computers ourselves, and the process rarely goes without issues. There can be hours of troubleshooting and many cases of components arriving completely dead. And even then, it's still a Windows PC or Linux box, and not a Mac. With the iMac Pro, everything should work exactly as intended, right out of the box, complete with macOS. And if it doesn't, Apple includes a one year warranty with some of the best support around. Now let's move onto what makes the iMac Pro the beast that it is. First off, the included display is one of the best available on the market. With a 5K resolution and P3 wide-color gamut, it's truly awe-inspiring. This the first time an iMac will get a processor with more than 4 cores. In fact, the base model comes with an 8-core Intel Xeon. You can even configure it up to an absolutely insane 18 cores, and this new Xeon line of processors can Turbo Boost up to 4.5GHz. Turbo Boost means that whenever thermal temperatures are down, the processor will actually overclock itself and push out more performance than rated. To make sure the temperatures stay down, Apple completely redesigned the cooling system with innovative dual fans, a massive heatsink and extra venting. This results in almost 75 percent more airflow and an 80 percent increase in system thermal capacity. This lets the iMac Pro handle 500 watts of power — 67 percent more than the previous iMac. The iMac Pro gets a top-of-the-line Radeon Pro Vega GPU, which is over three times faster than any previous iMac GPU, with up to 11 teraflops of single precision performance and 16GB of HBM2 video memory that boasts 400GB/s data transfer speeds. HBM2 is the latest tech in the video memory realm. It's still very expensive, and only a select few AMD video cards have adopted it. The base iMac Pro comes with four times more RAM than the latest base iMac, and it boasts faster speeds as well. It's also special ECC RAM, which is short for error-correcting code memory, which works to stop errors and data loss. Also, for the first time ever, you can configure it up to a massive 128GB of RAM. The base iMac Pro also comes with 1 terabyte of SSD Storage, and it's the fastest storage you can get your hands on, with 3,000MB/s speeds. For comparison, a regular SSD drive comes in at only around 500MB/s. The previous iMac was able to get this 1-terabyte SSD, but for an extra $700 over the 1-terabyte fusion drive. And for the first time ever, you can configure it to a 4-terabyte SSD on an iMac Pro. Now let's talk about the ports. The iMac Pro comes with four Thunderbolt 3 ports. That's double the amount of the previous iMac, which was able to either connect one 5K display, or two 4K displays on the side. With the iMac Pro, you can now connect two 5K displays, or four 4K displays. You can even hook up two RAID storage systems alongside two connected 5K displays. The iMac Pro also comes with a top-of-the-line 10-gigabit wired ethernet port, compared to the 1-gigabit ethernet port that came on previous Macs. It also comes with an SD Card slot with UHS-II Support, which means triple the transfer speeds compared to the card slot that came in previous iMacs. The FaceTime camera in the iMac Pro is also upgraded to 1080P Full HD, compared to 720P standard HD on previous iMacs. The built-in stereo speakers have also been enhanced to deliver broad frequency response, rich bass and even more volume. The iMac Pro is also getting four microphones, compared to just one on previous iMacs. The iMac Pro marks the first iMac to come in a Space Gray color, and it includes the new Magic Keyboard with the numeric keypad, as well as your choice of either the Magic Mouse 2 or Magic Trackpad. Like the iMac itself, all come in the new Space Gray color. Rumors have also sparked about the iMac Pro coming with a built-in A10 Fusion coprocessor. If this is true, then we can expect certain features like "Hey Siri," SecureBoot, and even potentially native iOS apps to come to the iMac Pro. We'll be getting our hands on an iMac Pro as soon as it's available, and the first thing we'll do is compare it to our specced-out 2017 5k iMac. Make sure to hit subscribe right now so you don't miss it. Let us know which features excite you the most about the upcoming iMac Pro in the comment section below.